Tag line: "You're only young once, but you remember forever"
Seventeen years after his debut film, Diner, director Barry Levinson continued his exploration of Baltimore in the 1950s with Liberty Heights, an endearing drama about a suburban Jewish family forced to keep up with an ever-changing society. Joe Mantegna is Nate Kurtzman, a good husband and loving father who runs a burlesque house and operates the local numbers racket. Despite his chosen profession, Nate is an honorable man, and he’s passed his values on to his sons, Van (Adrien Brody) and Ben (Ben Foster). Ben, whose school was recently integrated, has fallen for an African-American girl named Sylvia (Rebekah Johnson), and neither his parents nor hers approve of their relationship. Van, on the other hand, is in love with the beautiful Dubbie (Carolyn Murphy), who happens to be the girlfriend of his new pal, Trey (Justin Chambers). As for Nate Kurtman’s "business", things get a bit tense when Little Melvin (Orlando Jones), a black drug dealer, hits the numbers for $100,000, a sum Nate’s unable to pay. This leads to a battle of wills between the two men, one that quickly escalates into a dangerous situation. 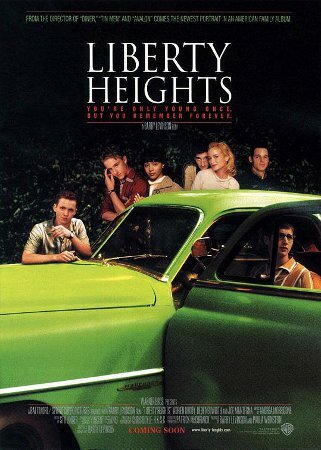 Set in the less tolerant 1950s, Liberty Heights addresses such hot-button topics as Anti-Semitism (Ben offends his family when he dresses up as Adolf Hitler for Halloween) and racial tensions (pushed to the forefront in both Ben’s relationship with Sylvia and Nate’s showdown with Little Melvin). Yet, surprisingly, the prejudice and small-mindedness these characters display over the course of the film never once detracts from our empathy for them. Sure, we may not agree with what they say or do, yet, regardless of how badly they behave, we always like them. Liberty Heights was the 4th of Levinson’s “Baltimore” movies (in between this and Diner were 1987’s Tin Men, starring Danny DeVito and Richard Dreyfuss, and 1990’s Avalon, a movie set at the turn of the century). 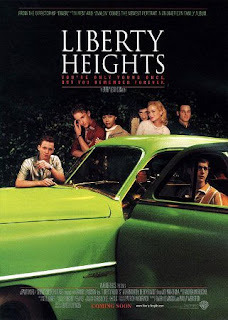 A native of Baltimore, Levinson clearly brings a bit of himself and his own experiences to each of these films, and while my favorite of the group is Diner, Liberty Heights does just as good a job recreating this specific time and place, and populating it with genuinely involving characters.